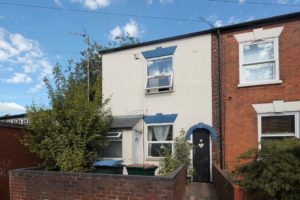 A beautifully presented three bedroom terraced house with a garage. Comprising of a fully fitted kitchen with integrated dishwasher, a washing machine and fridge freezer, downstairs cloakroom, lounge with patio doors leading to the low maintenance garden, two double bedrooms, a single bedroom and a family bathroom with shower over bath. No bills included. Council tax Band B.